We are delighted to announce that MMX, our first newly recorded album since 1986, will be released very soon, on both CD and DVD format, and that we are now ready to accept pre-orders for it! 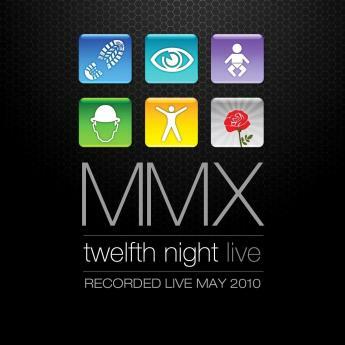 MMX comprises our complete live show from Wath-upon-Dearne recorded in May 2010. It has been mixed and produced by Clive with assistance from Mark. For those of you who didn’t experience the power and majesty of the six-piece band (and for those of you who did and want a reminder of the shows) then MMX comprises over two-hours of classic Twelfth Night. MMX is the definitive statement from this version of the band. We’re very proud of it! MMX is only available direct from us. The double CD is £12, the double DVD is £18, or you can buy them both together for £25 (plus postage). The easiest way to pay is using paypal. To make a payment please send it to Brian’s e-mail address: briandevoil@tiscali.co.uk or, alternatively, send a cheque or postal order payable to Brian Devoil to “The Brambles”, 1c Doggetts Farm Road, Higher Denham, Bucks. UB9 5EH, UK. (Please note if you pay by cheque/PO you can deduct £1 from the total cost). We anticipate that shipping will commence in the first week of November. all in our spare time! The definitive edition of Art and Illusion has sold remarkably well, and has received some great reviews. Reading Rock 83 has enabled us to move into DVD production, with great success, and we have big plans in this area. Play On has also gone to a second print-run and continues to sell steadily. We hope to make a 2010 supplement available as a free download early next year. The original Cyclops version of Voices in the Night has now completely sold out, so it has been added to our catalogue as our latest 9th archive release. None of this would be possible without your support – its great to see so many of you at our live shows, and we know that you appreciate the work we put into our CD/DVD release programme. Thanks! We’re taking a break from live shows, but we will soon be planning our activities for 2011. We don’t know exactly what form this will take, but it will be different to 2010, that’s for certain. this will be a reissue of our classic album Live and Let Live on both double CD and DVD. We know that many of you are looking forward to this. And in 2011, we hope to re-release Live at the Target, also as a double CD, and we are also looking forward to reviewing the audio and video from Loreley. Not only that but, early in 2011, we should be able to give you news of some more very exciting projects. But for now, as always, thanks for your support.